During My Three Weeks Spent In Greece, I Learned Quite A Couple Random Things. Did you know that pita is an actual bread? I honestly just thought it came in chip-form. 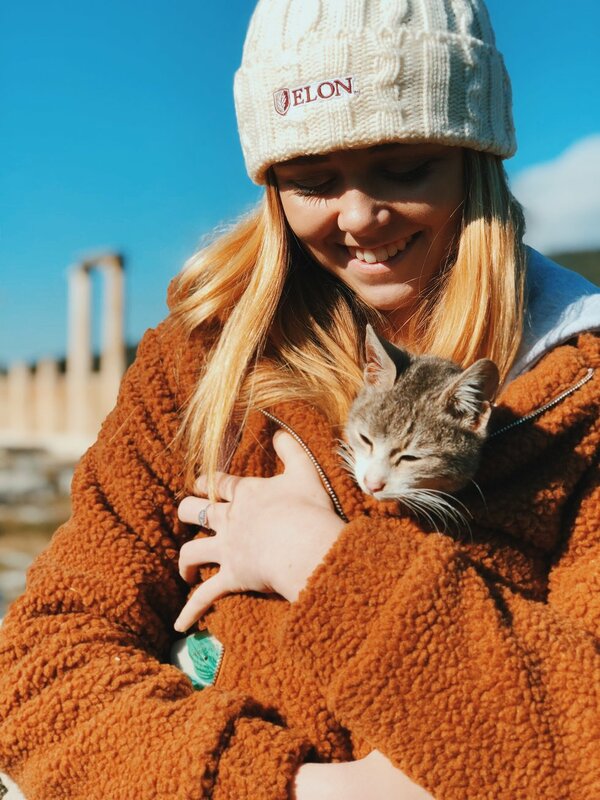 This past January, I had the incredible opportunity to travel to Greece with roughly twenty-five other classmates while we learned about the history of so many incredible cities. I had been to Greece briefly two summers, and by briefly, I mean we made two day-long stops on two different islands while on a cruise. This time, I was truly going to be immersing myself in the culture and among the people. I'm familiar with Europe in general, but I had always pegged Greece as much different from the other European countries I had visited before. Therefore, I was a bit nervous going into the trip, but I knew I was going to have a blast, and I was certainly right. Throughout the entire trip, I made a couple of interesting discoveries regarding the country, the world, and myself. Don't let that sincerity fool you, though. This list, while true, consists of purely random and comical findings. 1. Pita bread is in fact, a bread. Yes, the sub-headline is true. I did not know that pita bread was in fact, bread. I truly only knew of pita in the form of pita chips, and I thought that was it. But I was wrong, and thank goodness! Pita bread is absolutely delicious. 2. I can go longer than three hours without food. I am shocked. I am someone who usually gets hungry every couple of hours, especially if I have an early breakfast. Most days, we had a busy schedule in the morning that consisted of eating breakfast and leaving the hotel before 9 a.m. We'd usually then have a site or museum and sometimes wouldn't actually eat until close to 2:30 p.m. Much to my surprise, I made it without snacking, and I'm still alive. 3. Double rainbows are real, and they are just as beautiful as you'd imagine. Greece is beautiful enough, but during our visit to Crete, we were blessed with the presence of not one but TWO double rainbows on rainy days. 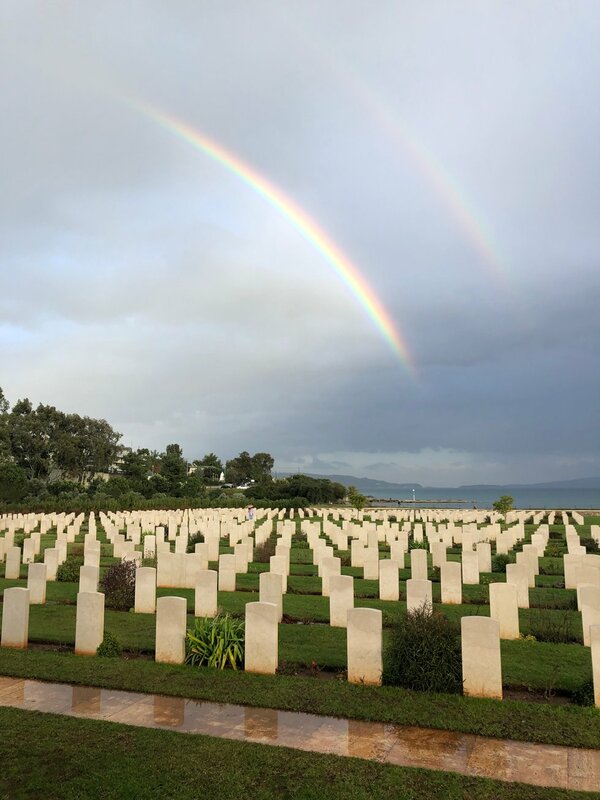 One of the times it appeared was over the war cemetery we visited in Chania. I had honestly never seen anything quite so stunning before. 4. "Grilled cheese" is truly cheese that is grilled. It is NOT a sandwich. Ah yes, coming across this realization stung a little bit. I remember absolutely craving a nice grilled cheese sandwich, and when I saw it listed on the menu for one of our group dinners, I was thrilled. When they brought out some kind of Greek cheese that was grilled, I would be lying if I said I wasn't just a little disappointed. Don't worry though, it was still delicious. 5. It is 100% okay to not tip at restaurants. No one is expecting you to. 6. Learning a little bit of language goes a long way. I cannot emphasize this enough. Learning some common phrases is not only fun, but it shows the Greek people that you care about connecting with them. They'll appreciate a simple 'kalimera' (good morning) and 'kalispera' (good evening), even if you butcher the pronunciation completely. 7. Gyros are a picky-eater's best friend. When I say I'm a picky eater, I mean I am THE picky-eater. I was worried about what I was going to eat while over in Greece because I did not know of one Greek dish that I liked. However, on the second day at lunch, I tried the most heavenly chicken wrapped in the best pita bread. This honestly saved me. Going forward, I knew that I'd be set in terms of food if I could just find a place that had gyros. Gyros are always the move. I'm absolutely serious. 8. 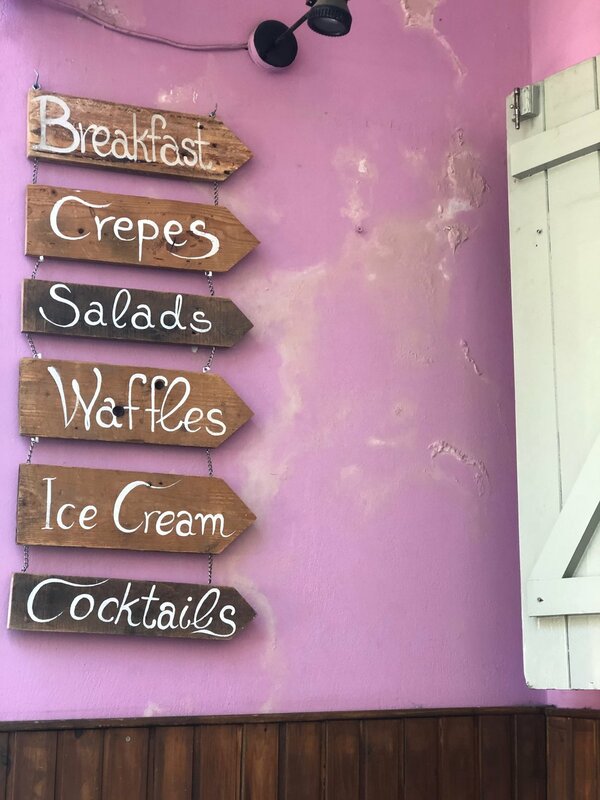 Waffles and crepes are not just desserts. They are acceptable anytime of the day. 9. It is okay to pet the stray cats. One thing that a lot of people will tell you, especially in a foreign country, is don't pet the stray animals. Now, usually I would listen if they weren't so friendly. However, our group attracted the sweetest stray animals who just wanted some love and attention. Just don't let them viciously bite you or claw your skin (if you don't scream or anything like that, then you won't have a problem). It also might be nice to carry around hand sanitizer for before meals, just to make sure. 10. French fries are certainly not just an American food. French fries are everywhere. I mean everywhere. If you need a break from all of the common Greek delicacies, just order a side of fries. Most places will have them, making it feel more like home. 11. Finding clothes that are both cute and cheap is EASY! You're lying to yourself if you say you're not going to buy a lot of clothes while abroad. Luckily though, depending on where you go, Greece has a lot of cheaper chain stores where you can find incredibly cute and affordable clothes. Even in a small town in the countryside, we found the cutest H&M-like store that had great deals and such a wide range of clothes. I was able to get so many cute items from European stores without spending a lot of money at all. 12. WATCH WHERE YOU WALK. This is also so so important. Even on the really narrow streets will cars and motorcycles try to squeeze through. Just always keep your eyes and ears peeled for any indication of a car or motorcycle about to whiz past you. 13. Greek people do not appreciate "Mo Bamba" like we Americans do. Lastly, and perhaps most important in this day in age, do not request "Mo Bamba" at karaoke. I know, it's upsetting. You'll hear a lot of other American music, but I guess "Mo Bamba" is not a fan-favorite. A lot of young locals might look at you like you're ridiculous.